I have recently purchased a new wok, it is a standard carbon steel one (Hancock/LondonWoks). I cleaned it in the sink using soap and water and then heated some water in the middle and coating started coming off, all good so far. I realised that it would be difficult to boil the whole thing in water as it is so large so thought I'd do something else I read, which was to use salt, heat the wok and toss around a large amount of salt to clean of the coating, this however didn't seem to work., the middle of the wok is silver but the rest more an orange. I have since tried water, scrubbing with a plastic scourer and cream cleaner, but it is still orange round the sides and silver in the middle. Right near the top it feels very smooth. I am wondering if I have burned the factory coating on, an if so what should I do, I don't want to make anyone ill with my food! I would say the opposite and you have actually burned "off" the coating. 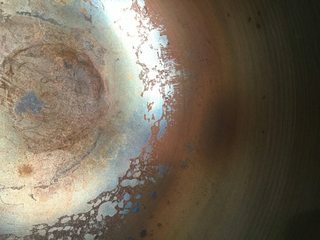 When those woks come off the factory floor, they are dipped or sprayed with that anti-rust sealant you are talking about. Most if not all instructions want you to get rid of this coating before use. When using carbon steel/cast iron cookware, one must season the metal first. Here is how I season all my carbon/cast iron cookware. Very thoroughly wash the wok in hot soapy water. This will get rid of that layer of rust prevention coating from the factory. Some manufacturers say to even use some cleanser and really scrub the wok clean. We want the seasoning to stick to the wok's bare metal not the factory's anti-rust sealant. Now thoroughly dry the wok off. You don't want any water on the wok, depending on your water, you can leave mineral deposits on the woks surface. Turn on your exhaust fan/blower, close the doors to the rest of the house and open the windows in your kitchen. Better yet, do this part outside if you can. It will get smokey and smell badly. Heat up the wok on low-medium heat. We want to slowly burn off any residual coating. This can take a while, and on an induction you most likely cannot get the sides of the wok. I recommend that this be done with a gas burner, just so you can get the entire pan seasoned, sides and all. Let the wok cool off to where you can handle it again. Perhaps 1-4 minutes, unless you have a thick cast iron wok, where it will be a bit longer. More mass, longer it takes to cool down. Repeat steps: 1,2 and 4. When the wok is heated up this time, there should be less or no smoke at all. It should be a bare metal pan, no rust protection coating. Now that the wok is warmed up, we can safely turn up the heat to the highest heat setting. We are looking for the wok's metal to actually change color. The wok might be a shiny metallic color at first, but we want it to discolour, to a brown or even blue or black color. This is the start of the seasoning layer. Move the wok to get the heat up the sides of the pan and even heat up the handle area as well. After the whole cooking surface of the wok has changed color, we cool it down again. This is where you want to oil season the wok. You want to use an oil that has a high smoking point. Canola, Crisco or best would be a grape seed oil. Do NOT use a low smoking point oil or fat, this will just burn and will not lead to a good coat. Do NOT use: olive oil, butter or lard. Use a paper towel with just a drop or two of your oil, rub down both the inside and outside of the wok. The thinner the coat the faster and more even the seasoning. Too thick a coat and the oil will pool up burn and get sticky. Thinner is better. Now place the wok over medium heat to burn the oil into the wok, all the way up the sides. Repeat as many times as you want. The thinner the layers of seasoning the better they stick to the wok. Too thick, and the layer will be sticky and will come off easier. I think the key is to really burn the wok without oil to open up the pores so to speak. This makes for that nice dark patina in the wok itself. Tips on cleaning the wok: After cooking, you want the wok to cool down before you wash it. There are some people that say never let soap touch the wok again. I would say as a hard and fast rule, probably ok. But if you really feel the need for soap, by all means do it. Wash throughly and dry thoroughly, you don't want to store a damp wok, this will lead to rust. Heat the cleaned wok on the burner and then wipe down with the oiled paper towel. Let cool and then store. Protective oil coating is good. If you plan on not using the wok for a while, season it and wrap it in an oiled paper bag. Tips on cooking with a wok: 1. Preheat the wok first. Medium fire at first, to where it's just barely smoking. 30-45 seconds 2. Adjust heat for recipe. Add oil to the wok, swirl it around to coat most of the woks inside. 3. Discard oil into a heat proof container, ceramic/metal bowl/cup. 4. Add new oil and wait just a second or four to heat up and collects in the center of the wok. I prefer to swirl the new oil around the edges of the wok. 5. Now you are ready to cook. If you need more oil use that initial oil again. I find that this method works very well. I have like 6 woks now. My wife is getting a bit peeved. But she doesn't cook that much so too bad. -If the damaged coating still has some plastic-ish properties, try aggressive solvents (acetone, nitro thinner, THF... familiarize yourself first with how to handle them safely, and make sure none remains before using the wok for food). -If it is carbonized or does not take to solvents: Emery paper. Not the answer you're looking for? Browse other questions tagged seasoning-pans wok or ask your own question. Thick carbon layer on wok? Why are my metal tools scraping off the patina of my wok? Is there any way to salvage an old rusted wok? 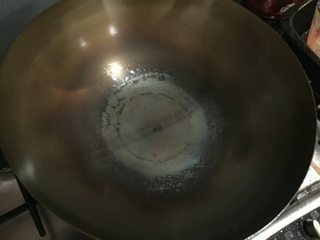 Wok patina; when to redo seasoning? I may have incorrectly seasoned my wok; can I fix it?